HOUSTON  (January 18, 2011)  The Houston real estate market put the wraps on 2010 with signs of improvement despite six consecutive months of declining sales. Prices of single-family homes across Greater Houston continued their upward march in December while sales volume sustained the smallest reduction since the declines began last July following expiration of the homebuyer tax credit. 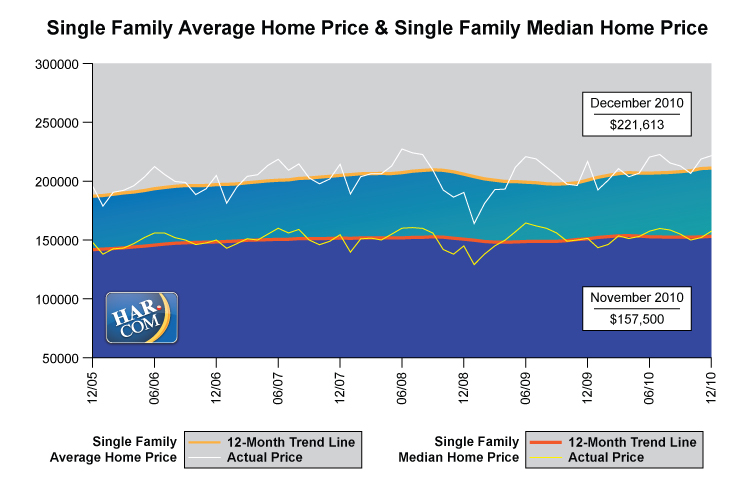 The average price achieved an all-time high for a December in Houston and the second highest level for all of 2010. According to the latest monthly data compiled by the Houston Association of REALTORS® (HAR), December sales of single-family homes throughout the Houston market slipped 3.9 percent when compared to December 2009. Positive sales activity was recorded in three of the five segments of the housing market, with the $150,000 to $250,000 segment experiencing its first growth since last May. Luxury home sales again helped push the latest pricing gains. The average price of a single-family home edged up 2.2 percent from December 2009 to $221,613 while the December single-family home median pricethe figure at which half of the homes sold for more and half sold for lessrose 4.0 percent from one year earlier to $157,500. Foreclosure property sales reported in the Multiple Listing Service (MLS) declined 14.3 percent in December compared to one year earlier. Foreclosures comprised 20.1 percent of all property sales in December, remaining consistent with the levels they held for much of 2010. The median price of December foreclosures fell 7.8 percent to $82,750 on a year-over-year basis. December sales of all property types in Houston totaled 5,131, down 3.0 percent compared to December 2009. Total dollar volume for properties sold during the month was basically flat at $1.08 billion. "We need to carefully watch how the Houston real estate market performs over the next couple of months before being able to truly determine how 2011 might pan out, but the December report contains encouraging signs," said Carlos P. Bujosa, HAR chairman and VP at Transwestern. "A slowdown in declining sales and improvement in pending sales bode well for real estate, however rising oil prices and concerns about the employment landscape are also factors to consider as we look ahead. Mortgage interest rates are edging up, and that might spur prospective homebuyers into making purchases earlier in the year." The Houston housing market concluded calendar year 2010 with strengthened pricing compared to 2009 and declines of 5.7 percent in single-family home sales and 4.6 percent in total property sales. On a year-to-date basis, the average price climbed 4.0 percent to $211,765 while the median price edged up 0.6 percent to $153,990. Total dollar volume for full-year 2010 dipped 1.2 percent to $12.3 billion compared to full-year 2009. The month of December brought Houston's overall housing market mixed results when all listing categories are compared to December of 2009. Total property sales declined slightly, total dollar volume was basically unchanged, and the average and median prices of single-family homes rose. Month-end pending sales for December totaled 2,821, up 4.5 percent from last year, signaling the possibility of improved demand when the January figures are tabulated. December's figure was an improvement from November's 5.8 percent decline in pending sales and the 23.2 percent and 17.2 percent drops the market suffered in October and September, respectively. The number of available properties, or active listings, at the end of December rose 13.5 percent to 49,005 compared to December 2009. Ongoing growth in available inventory combined with declining sales volume pushed December's inventory of single-family homes to 7.2 months compared to 5.7 months one year earlier. However, the figure is the lowest it has been since May 2010 and remains favorable compared to the national inventory of single-family homes of 9.5 months reported by the National Association of REALTORS® (NAR). * Months inventory estimates the number of months it will take to deplete current active inventory based on the prior 12 months sales activity. This figure is representative of the single-family homes market. December sales of single-family homes in Houston totaled 4,301, down 3.9 percent from December 2009 and a dramatic improvement after a decline of 22.0 percent in November 2010. This marks the sixth monthly decline in sales volume following four consecutive months of accelerated sales attributed largely to the tax credit. Broken out by segment, December sales of homes priced below $80,000 increased 9.2 percent; sales of homes in the $80,000-$150,000 range tumbled 14.2 percent; sales of homes between $150,000 and $250,000 were up 3.3 percentthe first increase that segment has recorded since May 2010; sales of homes ranging from $250,000-$500,000 slid 6.3 percent; and sales of homes that make up the luxury marketpriced from $500,000 and uprose 8.3 percent. The average price of single-family homes in December was $221,613, up 2.2 percent compared to one year earlier. That is the highest level recorded for a December in Houston and the second highest for all of 2010. At $157,500, the median sales price for single-family homes increased 4.0 percent versus December 2009, achieving its highest level for a December in Houston. The national single-family median price reported by NAR is $171,300, illustrating the continued higher value and lower cost of living that consumers enjoy in Houston. HAR also breaks out the sales performance of existing and new single-family homes throughout the Houston market. Existing home sales in December 2010 were unchanged from one year earlier. The average sales price edged up 1.9 percent to $202,036 compared to last year, while the median sales price of $145,000 climbed 6.6 percent. The number of townhouses and condominiums that sold in December dropped 9.4 percent compared to one year earliera dramatic improvement from sales declines of 42.7 percent and 37.0 percent in October and November, respectively. In fact, the December decline is the smallest since the downturn in sales volume began last July. In the greater Houston area, 386 units were sold last month versus 426 properties in December 2009. The average price reached its highest level since June 2008, rising for the first time since May 2010 to $171,206 compared to December 2009. The median price of a townhouse/condominium also rose for the first time since May 2010, climbing 14.3 percent to $140,000the highest level since June 2009. Demand for single-family home rentals rose 26.8 percent in December compared to one year earlier. Year-over-year townhouse/condominium rentals increased 25.5 percent. 7.2 months inventory of single-family homes is the lowest level in Houston since May 2010 and compares favorably to the national average of 9.5 months. The computerized Multiple Listing Service of the Houston Association of REALTORS® includes residential properties and new homes listed by 26,000 REALTORS® throughout Harris, Fort Bend and Montgomery counties, as well as parts of Brazoria, Galveston, Waller and Wharton counties. Residential home sales statistics as well as listing information for more than 50,000 properties may be found on the Internet at https://www.har.com. The information published and disseminated to the HAR Multiple Listing Services is communicated verbatim, without change by Multiple Listing Services, as filed by MLS participants. Founded in 1918, the Houston Association of REALTORS® (HAR) is a 26,000-member organization of real estate professionals engaged in every aspect of the industry, including residential and commercial sales and leasing, appraisal, property management and counseling. It is the largest individual dues-paying membership trade association in Houston as well as the second largest local association/board of REALTORS® in the United States.